A four-tonne bronze sculpture commemorating England's World Cup victory in 1966 has been unveiled in east London. The Duke of York, as president of the Football Association (FA), unveiled the £725,000 statue outside West Ham's Upton Park ground. 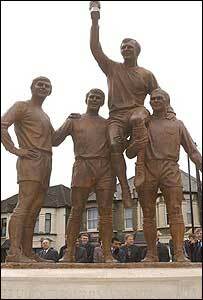 The sculpture shows England captain Bobby Moore holding up the famous trophy after being hoisted aloft by fellow West Ham players Geoff Hurst and Martin Peters, with Everton defender Ray Wilson. Sculptor Philip Jackson created it from photographs of the victory scene at Wembley Stadium after England beat West Germany 4-2 in extra time. Bobby Moore's widow Stephanie told BBC London: "I think he'd be somewhat bemused by it. "He was a very private man, a very modest man. "So I think he would have been bemused but privately he would have been very honoured and very, very proud." Sir Geoff Hurst, who scored a hat-trick in the final, told BBC London: "I'm very, very flattered. "I'm quite amazed, I never thought all those years ago, when I caught a number 285 tram and 40 bus from this very area that there would be a statue of myself and Moore and Martin and Ray." Sculptor Philip Jackson, who is currently working on a Golden Jubilee statue of the Queen, said: "The pictures were all taken during a 12-second period and Ray Wilson, the shortest man, was grimacing because he was taking most of Bobby's weight. "So the only artistic licence I've allowed myself was to take away the grimace - I didn't think he would mind." The statue was the idea of former Newham Labour councillor Graeme Cambage. He said: "After Bobby Moore died, I thought there ought to be a statue of him but it's taken a long time to realise my dream. "We secured a £400,000 grant from the Government and, after some small contributions from local people, the bulk of the remainder was paid by West Ham United Football Club." "How the Hammers would want the likes of Hurst and Peters in the current side"